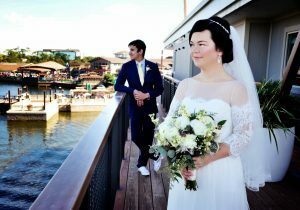 What a beautiful wedding for Enrique and Savannah above the water at Paddlefish. The couple me while on the college program at Walt Disney World and decided that Disney would be a great place to get married. Being that they were not far out of college their dream of a Walt Disney World wedding seemed out of reach when they contacted Victoria from Intimate Weddings of Orlando. Victoria explained the various options that they offer at Disney Springs and the couple decided on Paddlefish. With it’s modern feel and delicious food, this was the perfect fit for the two of them. Flowers by Lesley created the most beautiful bouquets and classic boutonnieres for the couple. Filled with yellow daisies, succulents, and white garden roses, and some lambs ear, it looked and smelled wonderful. Christopher Smith with Snap Photography photographed the couple from before the ceremony, into the ceremony, and afterward on the decks surrounding Paddlefish as Enrique and Savannah and their guests went in to enjoy a reception filled with all sorts of delicious food choices at Paddlefish.